Try out the latest training techniques, including our functional Freestyle™ training area and a wide selection of group exercise classes at Fitness First Select Citywalk Saket, New Delhi. Fitness First Select Citywalk, Saket is India's first and only Fitness First Iconic club, located on the 5th & 6th floor, of the most vibrant and premier shopping & leisure mall in the heart of South Delhi - Select Citywalk, Saket. This 20,000 square feet club is equipped with a comprehensive range of fitness equipment, including upgraded cardio equipment and has dedicated studios for Group Exercise and Spinning. Members at this club will be able to enjoy popular Group Exercise classes like Body Pump™, BodyCombat™, Yoga, Body Balance™, Zumba, Yoga, Step, Sh’Bam, TRX®and so on. Facilities at Fitness First Iconic Select Citywalk also include Personal training by our professionally trained and certified trainers, luxurious changing rooms with 5 star facilities, an upgraded member’s lounge including iMac Internet Stations, and a JOOST Bar for health and nutritious beverages made fresh, amongst many other features. Experience Fitness First with a guest pass or, if you’re ready to get started, join us now. NEED ADVICE? OUR EXPERT PERSONAL TRAINERS HAVE A WIDE RANGE OF SKILLS AND CAN OFFER ALL THE SUPPORT YOU NEED. Bosu training ,Kettlebell training, flexibility, weight loss Management, Creative workout, strength training, Sports Specific. 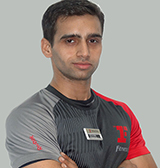 Certified Kettlebell trainer - level 1, Certified Personal trainer by Fitness first India,Certified in bosu training ,certified personal, trainer by gold's gym university, 1st DAN world Taekwondo federation black belt. Fitness is more that looking good. It's feeling good on both inside and outside. Be active be fit. First wealth is health. Weight Management, Functional Training, cardiovascular training, Strength & Endurance Training, Core Training, floor workout (body weight), flexibility training. 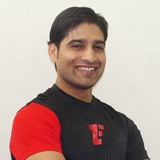 Certified Personal Trainer, Fitness first IN, Bachelor in physical education from IGIPESS, Certified gym instructor, THE GYM, Certified instructor (Aerobic), THE GYM , Certified BOSU Trainer. Do exercise and feel better. Bodycombat, TRX, Core Stability, Flexibility, Kickboxing, Functional Training, VIPR, Strength Building, Fat Loss. 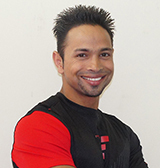 Certified Personal Trainer Fitness First , Certified Bodycombat Instructor, Certified TRX Trainer. When you meet an obstacle(excuses), lift up lunge forward. Just do it. Gedriatrie Population ,Pre & Post Natal Exercise, Arthritie joint Issue, Balance Training ,Mobility Training ,Special Population Training, Weight Loss. 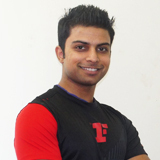 Bachelor in physiotherapy, international TRX Certified Trainer, International BOSU certified training ,international BAREFOOT Instructor, In-house VYPR, POWER Plate & Kettle Bells Trained. Yoga and aerobics, Cardiovascular training, Flexibility, mobility, agility and strength training, Sports specific training, Suspension and plyometric training, Pre and Post natal exercise. BPED from Barkatulla university, Certified yoga trainer, Certified in RMT, Certified resistance movement training from PT on the net. Y positive attitude to achieve goals. Weight Management, Master in rehab training, Specialist of dynamic functional training, Health, fitness & wellness consultant, Pre & post natal training, Lifestyle management consultant, Bio-mechanics & Posture correction specialist. 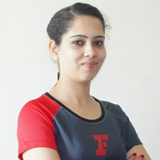 Bachelor in physiotherapy, Diploma in yoga & naturopathy, Certified in personal training, Fitness First certified trainer. Give perfection to overall health & fitness. Functional training, Obstacle course run, Flexibility and agility and speed, Posture assessment and correction, Kettlebell training and sport. 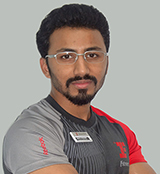 Certified personal trainer by ACE, Certified in RMT, Certified in TRX suspension, Certified in Kettlebell level 1, Certified in bosu personal and group training, Certified in fitness nutrition by ACE, CPR certified by Indian red cross society. First look at yourself and move to the gym , second make it worth because it's only 4% of your whole day. Functional training, Boxing, Flexibility, Weight loss, High intensity interval training, Sports specific, Cardiovascular training, Strength training. American council on exercise ,certified personal trainer from fitness first ,certified personal trainer from gold's gym university ,certified cpr from Indian red cross society. Things today others won't, so that tomorrow you can do the things other can't. Weight management, Muscle toning, body conditioning, Agility and flexibility, bodybuilding, core and balance training, Calisthenic Training, Functional training, Pre and post natal training. Certified Personal Trainer. Certified in RMT, Movement based flexibility, TRX & Suspension, Kettlebell, Bosu ball. Attended ACE's fitness training by Fabio Comana & Kettlebell workshop by Steve Cotter, IKFF. Weight Management, Functional Training, Sports specific training, Strength & endurance training, Agility & Flexibility, Stability & Mobility Training. 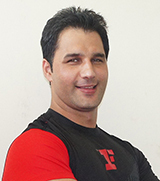 Certified Personal Trainer, Fitness first, IN, Certified Personal Trainer, American Council of Exercise(ACE), Certified personal trainer in International Fitness Association (IFA). Life is about living healthy and health is something that always you feel that now is the best time of life. Weight Management, Bodybuilding, Athletic Training, MMA Training, Shadow boxing, Boxing, functional training, Core Training. 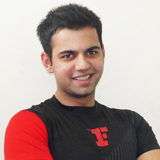 Certified personal trainer from Fitness First. Our Achievements are measured by the Impact we have on others. Strength & Endurance Training, Functional & Core Training, Weight Training, Weight Management, Flexibility, Lifestyle management, Bodybuilding, Flexibility Training. ACE Certified, Certified Personal Trainer Fitness First, CPR Certified. Push yourself & never be satisfied with your achievement. Aim should always be higher so you put your best to achieve.